Three games into the 2016-17 season, Boston College women’s hockey appeared to be a young team searching for its identity. The Eagles struggled on the road against Duluth—a team it swept in Chestnut Hill last year—and gritted out a win against a Maine team that won 10 games last year. 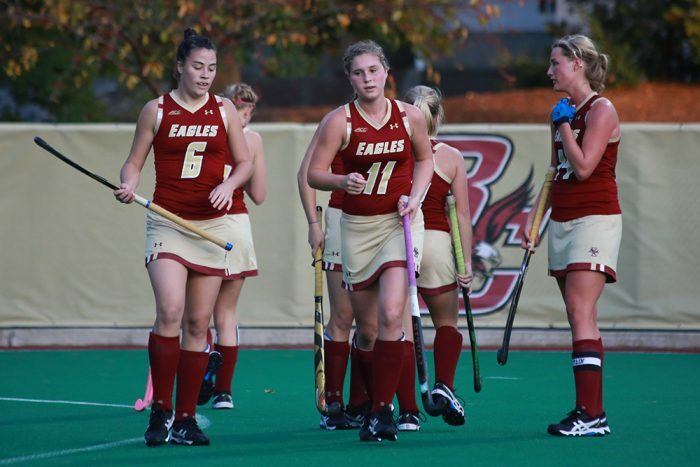 The conclusion of the 2015-16 season ushered out a senior class lead by the two top scorers in program history, Alex Carpenter and Haley Skarupa, that elevated BC to new heights. But now, in Game Four—a 5-1 defeat of Maine— it appears as though BC might have found the leaders of the new regime that will maintain the team’s 51-game unbeaten streak in Hockey East play. The second line for BC (3-1-1, 2-0 Hockey East), comprised of freshmen Delaney Belinskas, Caitrin Lonergan, and Bridget McCarthy, combined for all five of BC’s goals in the second leg of its two-game series with Maine. Four of those five came from Belinskas, making her the first BC freshman in over 20 years to score four goals in a game. The young line had a tremendous afternoon, showing great potential—something to be excited about for the upcoming years. Despite its inexperience, the second line provided a crucial goal early on. After Maine (1-5, 0-2-0) forward Tereza Vanisova put the Black Bears up 1-0 with 5:41 remaining in the second period due to a sloppy turnover in the neutral zone resulting in a breakaway, Belinskas buried the equalizer just 42 seconds later. Belinskas received a pass from teammate Grace Bizal, and skated into the zone before beating Maine goalie Carly Jackson top right over her flailing glove. The first goal came amid sloppy play from the Eagles who couldn’t capitalize on four power-play opportunities in the first period. “The response from our team to tie the game was extremely important, especially at this early point in the season,” head coach Katie Crowley said. The Eagles utilized the momentum from their first goal to pressure Maine into another penalty right before the close of the first period. After starting the second period on the power play, the Eagles drew a boarding penalty to make it a 5-on-3. Aided by these two penalties, just 52 seconds into the second period, Belinskas added her second goal to put BC up 2-1 off a tremendous feed from Lonergan. Just over a minute later, Belinskas completed her hat trick on the 5-on-4 as she exploded toward the goal from the neutral zone and ripped a wrist shot top-shelf from the faceoff circle. “I have been focusing on driving to the net, doing my thing, and staying simple,” Belinskas said. Belinskas added her fourth goal off another excellent feed from Lonergan 15 minutes into the third period. After intercepting a Maine pass near the BC blue line, Lonergan skated through the neutral zone and gave Belinskas a saucer pass over the Maine defender’s stick. Belinskas flawlessly settled the puck like a cool, calm veteran, and finished it past Jackson to put the Eagles up 4-1. This goal solidified the first four-goal effort for an Eagle since Skarupa did so last year against Boston University on Jan. 9. Afterward, Belinskas reflected on filling the shoes of Skarupa, who notched a hat trick herself in her first professional game with the Connecticut Whale. “It’s a big role, but you never want to get ahead of yourself,” Belinskas said. Finally with just a minute and a half remaining, McCarthy added the fifth and final goal for the Eagles after intercepting a pass near Maine’s blue line. This was the first career goal for McCarthy, the talented freshmen on the Eagles’ active second line. Despite the dominate result, the Eagles were not without their mistakes. The Eagles had seven penalties after having just 12 in the previous four games to start the season. While the BC penalty kill prevented Maine from scoring on all of its attempts, the team will have to clean up its play as its moves on to play better competition in the coming weeks. “We’ll have to get a better feel for the referees in the coming weeks, but I was proud of how our team killed off the penalties,” Crowley said.